The fifth annual Big Book takes the measure of Virginia’s economy in a series of charts and lists looking at a variety of industries and professions. Virginia Business compiled information for this year’s issue at a time of uncertainty. Growth of the state’s gross domestic product (GDP) has been tepid, 1.4 percent in 2015, a far cry from a decade ago when Virginia was one of the fastest-growing states in the country. One cause of Virginia’s slower growth is federal budget cuts. Total federal contract awards to Virginia firms fell from $60.2 billion in fiscal year 2011 to $48.6 billion in FY 2015, according to the Center for Economic Analysis and Policy at Old Dominion University. Virginia defense contracts fell from $42.9 billion to $29.6 billion during that time. Gov. Terry McAuliffe has put a high priority on diversifying the economy to make it less dependent on federal spending. The Virginia Economic Development Partnership, in fact, has for several years conducted a program helping Virginia defense contractors find new markets overseas. The slowing growth of Virginia’s economy has affected its rankings as a top state for business. Once the No. 1 state on several lists, Virginia has fallen out of the top 10 in some rankings in recent years. The presidential election of billionaire Donald Trump, however, has raised the possibility that federal spending will begin to increase again, at least for defense programs. But Trump’s ascension to the presidency also has been accompanied by a federal hiring freeze, a move that could impact Northern Virginia suburbs of Washington, D.C.
Also, efforts to repeal and replace the Affordable Care Act, also known as Obamacare, have raised concerns that Virginia would receive block grants providing much less federal money for health-care programs, such as Medicaid. McAuliffe says Virginia essentially would be penalized for not expanding its Medicaid program when the federal government sets thresholds for block grants. 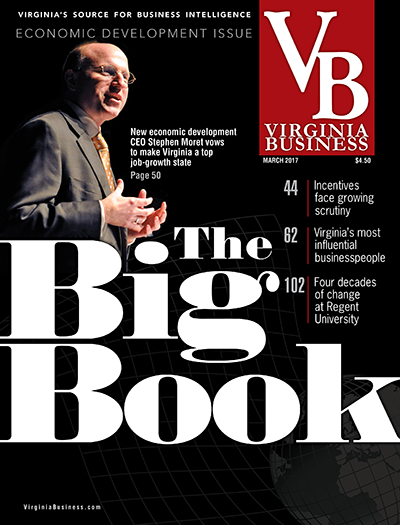 The Big Book offers snapshots of various aspects of the Virginia economy as it enters this new phase.